Last year's participant of TechHR Startup Program, Storecheq has grown its business from serving 10 to 20 companies to about 80 companies today. Read here to know about their journey and how they are helping companies solve engagement challenge through personalized e-gifting. In August 2016, around the festival of Rakhi, a gifting platform, Storecheq was launched. Its founder Vivek Gupta along with his team incepted the product between August 2015 and December 2015, with intent to enhance the corporate gifting experience for individuals. The aim was to give more choice and freedom to the ultimate user of the gift. Vivek and his team realized that organizations and employees usually struggle in choosing rewards for their various employees and often the employees don’t even like the gift. Personalized gifting experience: How does it work? Through a platform, Storecheq.com, companies can create their own branded gift cards. The platform allows them to configure these cards for denomination and validity and then these cards can be customized to carry the customers brand and communication. Interestingly, these gift cards and communication can be created by the users themselves on the platform. Later, these gifts can be sent across to the receiver electronically or physically. Further, Strorecheq also tries to ease the process of sending gifts by allowing its customers to send gift cards to 100s of receivers in one go, in less than five minutes. On the other side , the person who receives this gift card creates an account on Storecheq and adds the value of the gift card in his or her account. The receiver can then use this amount across more than 100 brands including Amazon, Flipkart, Big Bazaar, Shopper Stop, Lifestyle, M&S, Dominos, KFC, Bookmyshow, among others. Therefore, Storecheq is a unified platform to buy, sell, create and redeem gift cards. After struggling to find a suitable vendor, Vivek and team decided to build the product in-house. And that’s when they hired their first technical person, Tarun, who Vivek describes as a gem of a guy. He says, “Tarun came with the right mindset and energy. It took us one month of hard labor to get our first sneak of the product but ever since then we never looked back. We built a team and faced the challenges together. Here's where our experience of 20 years in corporate also came to the rescue." Storecheq took its first leap in October 2016 when it got its first customer on board. 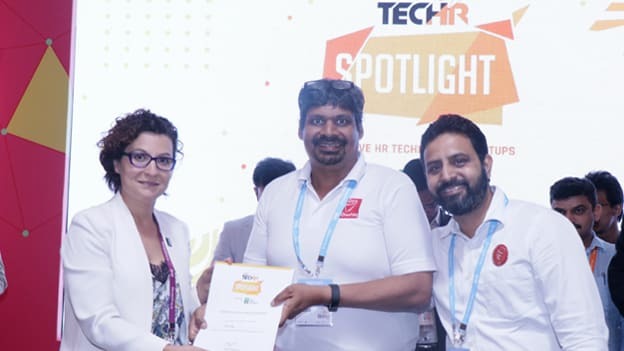 Later it went on to add many feathers to its cap, starting from being recognized by DIPP, the government of India, in Start-up India program to being shortlisted for People Matters TechHR Startup Program. From then on the team of Storecheq has expanded and so has its customer base. From a customer base of 20 companies in 2017, it has now moved ahead to serving about 80 companies, who are using Storecheq’s platform for various purposes like employee rewards and recognition, customer engagement, promotion, referral bonuses and festive gifting, etc. As Storecheq looks forward to scaling its enterprise segment in India further, it also wishes to take the platform global. The gifting industry in the country is expected to touch $84 Bn by 2024 from $65 Mn, at present, as per a report provided by Qwikcilver. And corporate gifting accounts for more than 80 percent of this market share. The proliferation of smartphones has led the millennials in the country to embrace digital gifting on a large scale and almost 66 percent prefer sending or receiving e-gift cards as compared to physical cards. In India, digital gifting contribution will scale 3-fold to be 8 percent share of the gifting market, with a market size of about $6 Bn. Leveraging the vast potential of this industry, a lot of startups are emerging in this sector and providing a variety of innovative gifting solutions and services. Thus there is a big opportunity for Storecheq to grow further and expand. However, it competes with several other gifting tech startups like xoxoday, Giveter and Giftology. How Storecheq will hold its fort amidst the growing competition and make most of the rapidly growing gifting industry is something to watch out for. NEXT STORY: HiPos in the digital age: Answering the what, why and how?